The Riggs investigation discovered that efforts by former Chilean dictator Augusto Pinochet to hide millions of dollars at Riggs go back to 1985, nearly 10 years earlier than previously known. By CRIMES AND CORRUPTION OF THE NEW WORLD. I put a lot of hours and work into this. All I ask is for you to leave my link in here if you want to copy or use this info. (spirituallysmart.com) Have any good information pertaining directly to this research? Email Me. T Lawrason Riggs (Son of George Washington Riggs) Founded St. Thomas More Chapel at Yale University and was also, Yale's first Catholic Chaplain, Ex Scroll and Key Member, Which is a Secret Society similar to that of Skull and Bones. Except Tax records show an endowment worth several million dollars more than that of Skull and Bones. T Lawrason Riggs was also an Intelligence Officer in WW1. Yale's comment on Thomas More, "St. Thomas More: The Man, The Saint Sir Thomas More served as Lord Chancellor of England under King Henry VIII. He was martyred for his opposition of Henry's sucession from the Church, and was canonized in 1935 by Pope Pius XI. For a more detailed biography, read this article from the Catholic Encyclopedia." New York Times Article from 1915: "SEES NO CONSPIRACY IN RIGGS BANK CASE; Judge Expresses Doubt as to His Power to Mandamus Treasury Heads. $5,000 FINE THE POINT..."
Biographical info on T Lawrason Riggs: Biographical Sketch (Yale Link) Born June 28, 1888, in New London, Conn. Died April 26, 1943, in New Haven, Conn. Father, George Washington Riggs (St. Mary's Coll., Oscott, Warwickshire, England), president Riggs & Company (later Riggs National Bank), Washington, D.C.and Janet Madeleine Cecelia (Shedden) Riggs of Washington. Mother, Medora (Thayer) Riggs; daughter of James Smith Thayer (B.A. Amherst 1838) and Medora (Cheatham) Thayer of New York City. Yale relatives include a brother, E. Francis Riggs Class of 1909. T. Lawrason Riggs Death due to coronary occlusion. Buried in St. Lawrence Cemetery, New Haven. Survived by no immediate relatives. Father Riggs left a bequest to St. Thomas More House, the income of which is to be used for the salary of the chaplain. T. Lawrason Riggs taught at Yale University,1916-1917; served with Mobile Hospital Units in World War I; ordained a Roman Catholic priest, 1922; chaplain Catholic Club at Yale, 1922-1938,and the More Club, 1938-1943; founded St. Thomas More Chapel; instructor at Albertus Magnus College, 1925-1938; administrator, Church of Our Lady of Pompeii, East Haven, 1922-1938; author and active on many boards. Fraternities: Psi Upsilon, Scroll and Key, Chi Delta Theta, and Phi Beta Kappa. T. Lawrason Riggs Drama Club Picture Here's an article from the NY Times showing he played a woman in one part. Scroll and Key members in 1866. It's the only picture in Yale's online records. John Carroll, and was Roman Catholic. Bad bank! You've been a very, very bad bank! I used to have a checking account at the Riggs Bank in Adams Morgan. It was near my apartment and looked like a place where people with money went to deposit it, even if I only went inside to drop the $25 I got after taxes on tips as a waiter every two weeks. They're a local DC favorite and have branches all over town. Well, it seems that some very nasty people also bank at Riggs, including a few dictators: "Riggs Bank courted business from former Chilean dictator Augusto Pinochet and helped him hide millions of dollars in assets from international prosecutors while he was under house arrest in Britain, according to a report by Senate investigators." "In May the bank agreed to pay $25 million in civil penalties for what federal regulators called "willful, systemic" violation of anti-money- laundering laws in its dealings with the embassies of Saudi Arabia and Equatorial Guinea. Several other federal investigations continue into the bank's activities, and Riggs has hired investment bankers to explore a sale of the company." Augusto Pinochet, (Knight of Malta)- right wing favorite, installed in '73 with Kissenger's help. Equatorial Guinea's president, Teodoro Obiang, pockets billions of dollars worth of oil revenue while his tiny nation remains mired in poverty. The Bush administration reopened the U.S. Embassy in E.G. after Obiang threatened to kill our ambassador in '96. As for Saudi Arabia, well, you know the story about most of the 9/11 hijackers and money came from there, but we decided to invade Iraq instead, etc..
Three dictators, all of whom are in power mainly by the will of Republicans, use Riggs to launder their ill-gotten gains. I guess now that Lincoln Savings ; Loan is out of business, the GOP has a new bank of choice. "I was eating lunch in downtown Washington with Mike Fitzgerald, the chief executive of the new Bank of Georgetown . . ."
Fitzgerald is a former employee of Riggs Bank, which is now part of PNC. He's hoping the B of G will be a community-based commercial bank . . ."
"Mike is 50, lives in Bethesda, and graduated from Georgetown Preparatory School (1975), received a BA (economics) from Fairfield University in 1979 and completed an MBA at Loyola College in 1981." In 2004, George H.W. Bush's brother, Jonathan Bush (Both Skull and Bones members) was on the board of Riggs Bank, which has been linked to terrorist money-laundering -- another Bush bank, down through the generations, funding causes like Nazism then, and terrorism now? Yale Bonesman Class of 1953. The FBI has probed how tens of thousands of dollars from the Riggs bank account of Saudi Princess Haifa flowed to the families of two Saudi students who subsidized two Saudi terrorists involved in the September, 11th attacks. Well-connected Riggs was widely considered to be an Agency bank(CIA) and was the bank used by about 95% of foreign embassies in Washington. Saudi accounts at Riggs were linked by investigators to some of the 9/11 hijackers. [Egyptian] President Mubarak received Mr. Stephen Joel Trachtenberg head of George Washington University. Mubarak and Trachtenberg, during their meeting, investigated Egypt's pivotal role for the economic development of the Middle East and joint educational projects between George Washington University and Egyptian universities. Egypt: source of four 9/11 highjackers. Coincidence? [Egyptian] President Mubarak received Mr. Stephen Joel Trachtenberg head of George Washington University. Mubarak and Trachtenberg, during their meeting, investigated Egypt’s pivotal role for the economic development of the Middle East and joint educational projects between George Washington University and Egyptian universities. -Egypt: source of four 9/11 highjackers. Coincidence? LEO J. O'DONOVAN, S.J. in 1993 President, Georgetown University; Trustee, University Age 61 of Detroit Mercy; Board member, Consortium on Financing Higher Education; Board member, Association of Catholic Colleges and Universities; Board member, Association of Jesuit Colleges and Universities. Riggs Bank was implicated in a money-laundering scandal involving Saudi Arabian diplomats & Princess and was ordered to pay $25 million in fines. Two of those transactions are alleged to have made their way to accounts of two of the September 11th hijackers. Riggs Vice Chairman, Director and President of its Riggs Capital Partners venture capital group; J. Carter Beese Jr. had previously been a SEC Commissioner for former President George H.W. Bush from 1992 – 1994 and served as the Chairman of the Capital Markets Regulatory Reform Project Center for Strategic and International Studies. Before that he was the Chairman of the big Skull & Bones financial firm Alex Brown International, until it merged with Bankers Trust. Following the merger he served as the Vice Chairman of Bankers’ Trust Alex Brown's Global Banking Group. Alex Brown Inc. was a blue-blood investment bank whose Baltimore roots were as deep as any institution in the city. There are a total of twelve (12) Brown Bonesmen, beginning with Alexander Lardner Brown (Skull and Bones – 1856) himself, and with the last one logging in for 1979. The Brown family name was associated with Brown & Shipley in London, Alex Brown in Philadelphia, Brown Brothers Harriman in New York, Baltimore & Ohio Railroad (the B and O) , Alexander Brown & Sons in Philadelphia, John A. Brown & Co. in Philadelphia, and even Brown University in Providence, Rhode Island. The Allbrittion family owns about 46% of Riggs Bank’s stock, and they have been major George H.W. Bush and George Bush donors for years! 'Committed Suicide' April 11th 2007 ~ Additional Article. George R Houston is also a member of this Jesuit fraternity ("alpha sigma nu") which uses this symbol to the right. Senior Vice President, National Geographic Soci- ety; Trustee, Supreme Court Historical Society; Member Advisory Board, Yale University School of Management; Director, Sweet Briar College. Physician; Clinical Professor of Medicine, Georgetown University School of Medicine; Director, National Capital Reciprocal Insurance Company; Member, Medical Society of the District of Columbia. James E. FitzGerald, S.J. was the 4th President of Fairfield University. 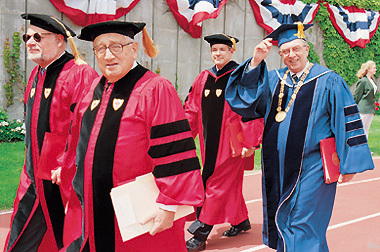 During his tenure, the Graduate Department of Education became the Graduate School of Education in 1963. George P. Clancy, Jr., age 61, Knights of Malta (SMOM) and is also Executive Vice President and Chief Lending Officer of Chevy Chase Bank, FSB, a position he has held since 1995. Mr. Clancy has an extensive career in banking which includes serving as President and Chief Operating Officer of The Riggs National Corporation (1985-1986) and President and Chief Executive Officer — Signet Bank, N.A. (1988-1995). Mr. Clancy is active in several community and civic organizations, including serving as Chairman of the Catholic Charities Foundation, Chairman of the Washington, D.C. Police Fund, Member of the Board of Trustees of the University System of Maryland Foundation, Inc. and the University of Maryland College Park Foundation. Mr. Clancy has been a director of Washington Gas Light Company and a director of WGL Holdings since December 2000. Wall Street Journal reported that of particular concern, Riggs failed to monitor "tens of millions of dollars in cash withdrawals from accounts related to the Saudi Arabian embassy," including "suspicious incidents involving dozens of sequentially numbered cashier's checks and international drafts written by Saudi officials, including Saudi Ambassador Prince Bandar bin Sultan." According to the 4/18/04 Washington Post, Saudi Prince Bandar's wife, Princess Haifa al-Faisal, "may have used a Riggs account to donate money to a charity that then gave some of it to the Sept. 11 terrorists." According to the Washington Post, federal regulators "called Riggs actions a "'willful, systemic' violation of anti-money-laundering law." Riggs officials have "acknowledged years of deficiencies in reporting to law enforcement hundreds of millions of dollars in suspicious financial transactions by foreign customers, particularly those connected with the embassies of Saudi Arabia." PRESIDENT BUSH'S UNCLE IS A CHIEF EXECUTIVE AT RIGGS BANK According to the nonprofit Texans for Public Justice, Jonathan Bush is the President and CEO of Riggs Investment Management - a major arm of Riggs Bank. He is also the uncle of President George W. Bush. The President "credits the investors sent his way by this banker uncle as a key to his 'success' in the Texas oil industry in the early '80s." According to Public Citizen, the uncle Jonathan was a Bush Pioneer, having raised more than $100,000 for his nephew in 2000. Wait, they're with Bush and with the terrorists? That doesn't seem to fit with the administration's decree of the binary dualism of the war on terror. But I digress. So, Riggs Bank got themselves into trouble trouble because they had illegal dealings with certain saudis. Really? Who could have guessed that there'd be anything but good, prudent, legal banking going on after they opened a branch inside the Saudi embassy?! That's the same building, by the way, that featured in its own segment in Michael Moore's Fahrenheit 9/11, a movie which focused heavily on the business connections between the Bush family and the House of Saud. But W isn't the only Washington president with connections to both Riggs and the Saudi Royal Family (nor is he the best paid). Meet Steven Joel Trachtenberg, the oft' top-hatted president of the George Washington University. The connection between GW and Riggs runs deeper than Trachtenberg's position on the bank's board. Robert Allbritton, Riggs' CEO and son of its largest shareholder, is a member of the GW Board of Trustees (Albritton refused through a spokesman to comment). In addition, Riggs is one of four or five banks that handle the University's finances. Ouch. Well, at least GW doesn't have any connection to Saudi Arabia. Oh, Wait. There's that whole Saudi Princess thing. Apparently, GW has set up a sort of distance learning program for Saudi royals. Courses in which two Saudi princesses wish to enroll are held in a special classroom in the media building, where the students and professor are recorded with video equipment and desk-mounted microphones; the recordings are taken by daily courier to Riyadh (at least, so said one professor). In effect, the university has set up a satellite campus inside the Saudi royal palace, one-upping Riggs' embassy franchise. (For those familiar with GW, such behavior should come as no surprise; while only medium-sized, the university has 3 separate campuses in DC and Virginia.) And as to that embassy: if Michael Moore found its placement so close to the White House suspect, we should be positively alarmed at its proximity to GW. Early in 1889 E. Francis Riggs, as a memorial to his father, donated the funds to fit out the Healy Building's south pavilion as a modern and capacious library. The original room was designed for 105,000 volumes, more than twice the number to which the university laid claim. The new library--and perhaps incipient rivalry with the recently-founded Catholic University across town--led to very rapid growth in the library's ollections, fueled not least by an outpouring of gifts not before paralleled in the library's history. The catalogs for the years 1890 to 1900 record donations far in excess of those of the previous ten years. Samuel Morse: In 1810, he graduated from Yale University. Prescott Bush entered Yale University in 1913. Prescott had spent the last five years before college in St. George's Episcopal preparatory school in Newport, Rhode Island. Averell Harriman (class of 1913) and Percy A. Rockefeller (class of 1900), paid special attention to Prescott's class of 1917. 1836 William Wilson Corcoran opens a note brokerage house---an early form of bank. 1837 Businessmen from New York and abroad, including former neighbor Elisha Riggs, shield the Corcoran brokerage house from collapse during the economic panic. 1840 Corcoran and George Washington Riggs, Elisha's son, form Corcoran Riggs, a partnership that offers depository and checking services. 1842 States-rights Democrat John Tyler is the first President of the United States to bank at Corcoran ; Riggs. 1844 The U.S. government selects Corcoran ; Riggs as the sole federal depository in Washington. 1845 Corcoran ; Riggs finances the invention of the telegraph by Samuel Morse. Corcoran ; Riggs purchases the buildings and assets of the Washington branch of the defunct Second Bank of the United States, located across the street from the Treasury. Corcoran ; Riggs invests heavily in railroads and land, contributing to the nations push westward. 1847 Corcoran ; Riggs lends $16 million to the U.S. government for the Mexican War and subsequently covers the loan by selling bonds to London financial houses. As the first sale of American securities in Europe since 1837, this transaction bolsters the credit of all American bankers. 1850 Senators Henry Clay, John C. Calhoun and Daniel Webster bank at Riggs. 1853 U.S. Army Corps of Engineers opens Corcoran ; Riggs accounts for construction of the Washington Aqueduct and the extension of the Capitol. 1854 Corcoran retires to devote his life to private investments and charitable causes; George Washington Riggs takes over the bank under its new name, Riggs ; Co.
1861 Abraham Lincoln opens an account at Riggs shortly before Civil War hostilities begin, only weeks after Confederate President Jefferson Davis closes his account. 1865 Instead of accepting a charter under the new national bank act, Riggs ; Co. remains a private bank. This decision accounts for the bank's stability in the aftermath of the Civil War. 1868 Upon the request of Secretary of State Seward, Riggs ; Co. supplies $7.2 million in gold bullion to the U.S. government to purchase Alaska from Russia. 1873 Financial panic throws banking houses across the nation into confusion, yet Riggs deposits double within the next three years. 1889 Elisha Riggs Donates a Library to Jesuit Georgetown University as a memorial to his father, George Washington riggs. 1896 Riggs ; Co. accepts a national banking charter. The Riggs National Bank elects its first board, sells stock, and shifts its focus from specialized investment services to general banking services for a large clientele. Glover becomes the first president of the bank. 1900 Lawrason Riggs, the last member of the family associated with the bank, retires from the board of directors. With deposits of more than $5 million, Riggs is twice as large as any other bank in the District of Columbia. Riggs issues stock to National City Bank, the largest New York bank, to forge a profitable alliance. 1902 Successful American reports: "The Riggs National Bank is to Washington as the Bank of England is to London." 1904 Headquarters at 1503 Pennsylvania Avenue opens. It features a Ladies' Department designed to meet the special needs of women, including American Red Cross founder Clara Barton and suffragist Susan B. Anthony. 1907 Even though a panic creates severe money shortages, Riggs pays an extra dividend to its shareholders. 1908 Charles Glover presents his plan for economic relief to Congress. This serves as the foundation for a series of financial reforms, including the establishment of the Federal Reserve System in 1913. 1915 Moody's financial monthly reports that Riggs has been for years the favorite bank of army and navy officers, through whose travels its name has been carried to all parts of the world. It has been said that in the Far East the Riggs Bank is the best known American banking institution. 1919 General John J. ("Black Jack") Pershing salutes from horseback during his victory parade. He later joined Riggs' Board of Directors. 1920 Riggs takes advantage of provisions in the Federal Reserve Act that allow national banks to accept savings deposits and establish a trust department. 1921 Former Assistant Secretary of the Treasury Milton E. Ailes succeeds Glover. 1922 Following consolidations with two local banks, Riggs opens its first four branches. 1925 After the sudden death of Milton Ailes, Robert V. Fleming becomes Riggs' president at the age of 35. 1928 Riggs merges with Farmers and Mechanics Bank of Georgetown, which a Riggs family member helped found in 1814. 1929 Whereas over-speculation strains the resources of most banks, Riggs does not lose any assets because of bad loans or investments following the Great Crash. 1931 Riggs Bank provides $500,000 in cash to Perpetual Savings and Loan of Washington. Depositors and other banks match this sum to end runs on Perpetual. 1933 Fleming advises Roosevelt regarding the structure of the newly established Federal Deposit Insurance Corporation. 1935 The American Bankers Association elects Fleming its president. 1939 Total assets are $119 million, compared to $57 million when the Great Depression began. During those years, 40 percent of all U.S. banks failed. by 1945 Riggs will have sold $233 million in war bonds. 1942 The Bureau of Standards stores their most precious items -- standards of length and mass made mostly of platinum --in the vaults at the Chevy Chase Branch on Connecticut Avenue for safety against air raids. 1943 Riggs provides the accounting facilities for the Office of Price Administration, which distributes ration coupons for basic commodities such as sugar, gasoline, meats, and shoes. 1946 Riggs begins to emphasize GI, home, auto and other consumer- oriented loans as the post-World War II boom begins. 1947 Riggs processes a World War II loan repayment of $50 million, the largest check ever drawn on a District bank. 1948 Riggs' general ledger books are done by machine instead of by hand for the first time. 1949 Nationally syndicated newspaper columnist Bob Considine calls Riggs "just about the closest thing we'll ever have to a Bank of the United States." 1950 Riggs' International Division develops a special relationship with the new International Monetary Fund and World Bank; most embassies are now customers. 1951 Korean War commander Matthew B. Ridgway is a Riggs customer, continuing a military tradition which includes William Tecumseh Sherman, Ulysses S. Grant, Douglas MacArthur, Chester Nimitz and Dwight D. Eisenhower. 1958 Riggs now has 13 branches, after recent mergers with Washington Loan and Trust and Lincoln National Bank. 1961 Riggs sponsors its first television program, World Concert Series, broadcast Sundays at 2:00 p.m. Guests include Arthur Rubenstein and Marian Anderson. 1962 Following the Cuban Missile Crisis, Riggs immediately implements a new plan to store bank records "in vault storage space in a mountainous area distant from the City of Washington." 1963 The Fleming era ends the same year that Riggs opens its new corporate headquarters. Lewellyn Jennings, former deputy Comptroller of the Currency, takes over as Chairman of the Board. The computer begins to service customer accounts. 1967 Riggs and Data Computer Center, Inc. (renamed Riggs Computer Services, Inc. in 1970 and absorbed into the bank in 1972) established to provide automated accounting services for business customers. At this time a young named George P. Clancy, Jr. begins as a management trainee and worked his way up to president and chief operating officer. He also attains to a very high position as a Knight of Malta (SMOM) and is named on the board of directors for Jesuit Georgetown's Woodstock Seminary on the Georgetown Campus in 1998. 1969 Riggs opens its first TV Drive-in windows using television cameras, audio systems and pneumatic tubes at its Chevy Chase Branch. 1970 Riggs installs its first computer system that enables staff to view a customer's account on a monitor. 1971 The Advertising Club of Metropolitan Washington awards its top honors to Riggs for its first venture into television advertising---a ten-second ``Bank-by-Mail" commercial. 1972 Riggs' first overseas branch opens in Nassau, Bahamas to serve the Euro-dollar deposit and loan requirements of its customers. 1973 Upon the invitation of the British Embassy, Riggs opens its first facility with a foreign embassy in Washington. Luis F. Corea, Riggs' Senior Vice President in charge of the Foreign Department, receives the National Order of Merit from the French government at its embassy in Washington in recognition of his contributions in banking. 1976 Riggs introduces 24-Hour teller machines at its branches. Customer usage is twice the national average for similar equipment. 1980 Riggs becomes Washington's first and only bank to open a branch in London. Riggs National Corporation is formed as a holding company including all companies sharing the Riggs identity. Riggs International Banking Corporation (Edge Act Bank) opens in Miami to focus on serving non-U.S. citizens. 1981 Joe L. Allbritton becomes the first active chairman of Riggs National Corporation. He also runs the ABC affiliate in Washington D.C.
1982 When federal deregulation permits bank money market accounts, Riggs gains a greater share than any other District bank, exceeding the $1 billion mark within three years. 1983 ``The most important bank in the most important city in the world" provides the theme as Riggs launches a long-range campaign emphasizing its service capabilities and its commitment to customers. 1984 Riggs purchases the Anglo-Portuguese Bank to form Riggs Bank Europe. 1986 Riggs joins CIRRUS, a nationwide system of 10,000 automatic teller machines, thereby providing customers access to their accounts at more than 12,500 sites. Riggs opens its first branches in the suburbs as The Riggs National Bank of Virginia with the acquisition of Guaranty Bank and Trust. Riggs dedicates its newly-restored building on 1503 Pennsylvania Avenue to W.W. Corcoran. 1987 Riggs Bank launches private banking to give clients a one-on-one relationship with an experienced financial advisor. Riggs expands into Maryland as the The Riggs National Bank of Maryland with the acquisition of First Fidelity Bank of Rockville. 1988 The U.S. Treasury Department awards Riggs the contract to consolidate its separate collections systems. CA$HLINK replaced cash payments with electronic transfers and streamlined the government's cash management system, resulting in significant cost savings to the government. At the request of the State Department, Riggs opens a branch at the U.S. embassy in London. Riggs Investment Management Corporation (RIMCO) is created as a subsidiary of Riggs Bank to manage all the money in the trust department and new clients in the institutional, non-profit and pension markets. 1989 Farmers and Mechanics Branch in Georgetown is restored to its original neo-classical style, particularly its interior details and gold dome. 1990 Riggs Bank forms the Financial Services Group by merging private banking, RIMCO, and the trust department to enhance customer service. Riggs purchases certain assets and assumes the deposits of the National Bank of Washington. 1993 To date, at least twenty-one First Families have banked at Riggs. 1996 Riggs builds upon its reputation in embassy banking in Washington and extends its banking services to non-U.S. embassies in London for the first time. Customers can meet nearly all their banking needs, including investment sales, by simply placing a telephone call with the establishment of RiggsDirect. While on an economic development mission to Bosnia and Croatia, Paul Cushman III, head of the International Division, dies in a plane crash with U.S. Commerce Secretary Ronald Brown. 1997 Riggs ; Company is formed, bringing together the services of RIMCO and the Riggs Financial Services Group. The subsequent purchase of J. Bush; Co., Incorporated as well as alliances with life insurance agents and brokers and Peat Marwick (KPMG) enable Riggs to bring a comprehensive range of financial services to its clients. Riggs offers a full-range of banking services, including investment sales, on the web. 1998 Riggs Capital Partners is founded to invest in emerging companies, with particular emphasis on the Washington, D.C. area's vibrant technology market. 1999 Riggs Investment Corp., a broker/dealer, is established; its Investment Centers, located at several branches, provide planning for reduction of taxes, retirement, college education, and wealth building and preservation. Upon the request of the State Department, Riggs Europe opens a branch in Berlin, the capital of a reunited Germany. New eagle trademark is introduced to broaden Riggs' identity as a provider of a full spectrum of financial services. U.S. Treasury Department selects Riggs Bank to redesign and manage the CA$HLINK cash management system, the largest deposit and cash reporting system in the world. complex named the Paul Cushman III International Financial Center. 2000 Riggs Investment Banking is launched, offering corporate clients access to a variety of capital markets and financing opportunities. Riggs ; Co. International opened two new offices - one in London and the other in Jersey (Channel Islands)- with a customer-built state-of-the-art information technology platform that provides customers with sophisticated, integrated information on their banking arrangements and investment portfolios. The End of Riggs National Bank? Though Riggs has paid more than $50 million in fines and settlements to shareholders and prosecutors in the United States and Spain, including $8 million from the bank and $1 million from the Allbrittons into a fund to benefit Pinochet's victims, in eight months since that July report, no Riggs executive or board member, past or present, has offered any public statement of regret. Contrary to nearly every other major scandal at a public company in recent years, Riggs has offered no public accounting of the events surrounding the company's hiding of Pinochet's money or of the broader failures of its international division that caused Riggs's downfall. That is not likely to change. Riggs on May 13 will be merged into Pittsburgh's PNC Financial Services Group Inc. Riggs's board will disband, and a more than 160-year-old institution steeped in the early financial history of the United States will cease to exist. At least several hundred Riggs employees are expected to lose their jobs. October 5, 2006, GW TO RECEIVE HISTORIC RECORDS FROM PNC-RIGGS BANK ARCHIVES VALUED AT MORE THAN $5 MILLION. Peabody is the acknowledged father of modern philanthropy, having established the practice later followed by Andrew Carnegie, John D. Rockefeller, and Bill Gates. The documents from Riggs, Peabody and Co., a predecessor of J.P. Morgan Chase, include a December 1833 receipt for a pair of shoes for a slave named Sally. The documents from Riggs, Peabody and Co., a predecessor of J.P. Morgan Chase, include a December 1833 receipt for a pair of shoes for a slave named Sally. For William W. Corcoran, a client of George Peabody, there was a receipt for an August 1832 ad placed in the Columbia Gazette for the private sale of slaves. And there was a Peabody and Riggs receipt listing slaves transported on a ship called the Aurora. The present Vice President, George Bush, is the son of Prescott Bush, a partner of Brown Brothers Harriman, for many years the senator from Connecticut, and the financial organizer of Columbia Broadcasting System of which he also was a director for many years. To understand why these firms operate as they do, it is necessary to give a brief history of their origins. Few Americans know that J.P. Morgan Company began as George Peabody and Company. George Peabody (1795-1869), born at South Danvers, Massachusetts, began business in Georgetown, D.C. in 1814 as Peabody, Riggs and Company, dealing in wholesale dry goods, and in operating the Georgetown Slave Market. In 1815, to be closer to their source of supply, they moved to Baltimore, where they operated as Peabody and Riggs, from 1815 to 1835. Peabody found himself increasingly involved with business originating from London, and in 1835, he established the firm of George Peabody and Company in London. He had excellent entree in London business through another Baltimore firm established in Liverpool, the Brown Brothers. Alexander Brown came to Baltimore in 1801, and established what is now known as the oldest banking house in the United States, still operating as Brown Brothers Harriman of New York; Brown, Shipley and Company of England; and Alex Brown and Son of Baltimore. The behind the scenes power wielded by this firm is indicated by the fact that Sir Montagu Norman, Governor of the Bank of England for many years, was a partner of Brown, Shipley and Company. * Considered the single most influential banker in the world, Sir Montagu Norman was organizer of "informal talks" between heads of central banks in 1927, which led directly to the Great Stockmarket Crash of 1929.
dinner, celebrating American Independence, became extremely popular with the English aristocracy, many of whom, while drinking Peabody's wine, regaled each other with jokes about Rothschild's crudities and bad manners, without realizing that every drop they drank had been paid for by Rothschild. In 1835, like most of the other former British colonies, Maryland was saddled with debt. They had taken out loans from London banks to finance railroads and canals, which they hoped would spur business and foster trade. When the new commerce failed to materialize, Maryland, like several other states, found herself in a financial pickle. Local hatred toward foreign bankers caused state legislatures to threaten to renege on the loans, and Peabody was selected to lead a commission to renegotiate the debt. Peabody successfully argued that only more loans would assure repayment of the old ones, and secured an additional $8 million for Maryland. While in London, Peabody fell in love with the business and lifestyles of the city's merchant bankers, and he decided to move there and form his own bank. In 1837, with a loan from Riggs, he did just that, setting up Peabody, Riggs and Co. at the prestigious address of 31 Moorgate in London. Now he was shoulder-to-shoulder with such banking luminaries as the Baring Brothers, who had financed the Louisiana Purchase, and the aforementioned Rothschilds. But it was an uphill battle for Peabody in this new enterprise. State after state reneged on interest payments, and five American governors formed a debtor's cartel leveraging for debt repudiations. Peabody's partner, Riggs, wanted out of the arrangement, and Peabody was forced to go it alone. Moreover, entry into the celebrated society of British bankers – already difficult for an American – became impossible under the cloud of defaulted American loans. Elisha Riggs who was partners with Peabody who started the JP Morgan Company. Death of George W. Riggs. THE WELL-KNOWN BANKER EXPIRES ABOUT THREE O'CLOCK THIS MORNING. last two weeks. He began to complain of ill-health about three months ago. and ten allotted to man, had been almost entirely free from serious illness. seized with hemorrhage and sank into a stupor from which he never rallied. past that the news was unexpected. hand to the poor and needy. house at home or abroad. born and reared, and in whose midst he passed away. with his father, and received a training which proved of great value to him. having the general government assume the responsibility of District bonds. He was one of the most active men in the Washington and Georgetown Railroad company: was one of the founders of the National Union Insurance company, and a trustee of the Corcoran Art Gallery. gave a thought to it," continued the same gentleman. children are here except Mrs. Henry Howard, who is aboard with her husband. bank. The firm as now composed consists of Messrs. John Elliott, Charles C.
Glover, Thomas Hyde and E. Francis Riggs, the latter being the son of Mr.
Geo. W. Riggs. Mr. Elliott has charge of the branch house in New York. place Saturday morning from St. Aloysius church. assassinated in Puerto Rico by Nationalists. Hiram Rosado and Elias Beauchamp assassinated Colonel Riggs. They were arrested, and summarily executed without a trial at the police headquarters in San Juan. Elias Beauchamp, assassin of Police Colonel Elisha Riggs. Two Nationalists recently assassinated Colonel Elisha Francis Riggs, chief of the insular police and personal friend of Senator Millard Tydings. Last week six Puerto Rican policemen and officers were indicted for the murder of the two Riggs murderers, who were mysteriously shot down in the police station when they tried to seize arms after their arrest. which is a typical CIA confusion tactic. Colonel Riggs was shot and killed by a Puerto Rican nationalist following a pursuit of suspect he had observed shooting at another police officer in San Juan. Colonel Riggs pursued the suspect and was able to take him into custody. As he did so a second suspect approached and shot Colonel Riggs in the head, killing him. Both suspects were apprehended and taken to the police headquarters, where they were both killed in a reported escape attempt. Colonel Riggs was a U.S. Army veteran who had been appointed to the Puerto Rico Police Department. "Pedro Albizu Campos said himself that Col. E. Francis Riggs, chief of the insular police, was a most dangerous representative of U. S. imperialism because he was one of the most popular U. S. officials ever stationed in Puerto Rico. As Colonel Riggs, who never went armed, was driving home from mass one Sunday morning last month, a murderous young Nationalist killed him with three well-aimed shots. Public grief at his assassination knew no bounds." Yale Obituary (Interesting info) Shows he was a member of the Secret Society, Scroll and Key as his brother T Lawrason Riggs was. And that he was a very highly decorated military personel and worked in the intelligence field which is probably what he was really doing in Peurto rico when he was assassinated. "The wedding ceremony was performed by Rev. T. Lawrason Riggs, Scroll & Key 1910, whose father, Elisha F. Riggs, was president of Riggs & Co. (later the Riggs National Bank). He was on the executive committee of the National Conference of Christians and Jews 1928-1943. His grandfather, George Washington Riggs, was in the Yale class of 1833. (Bulletin of Yale University. Obituary Record of Graduates of Yale University Deceased during the Year 1942-1943, pp. 110-111.) His brother, Elisha Francis Riggs Jr., S&K 1909, was military attache at the American Embassy in Petrograd, Russia from 1916-1918, then in the office of the Military Intelligence Department in Washington." addition info on a Lawrason Riggs III and other Riggs family members. Mr. Cameron was awarded the Saunders Medal for "distinguished administration in finding and development of new mines and for inspiring leadership in the non-ferrousindustry. "Mr. Cameron succeeded Mr. Fletcher as Chairman of the Board of Trustees on May 8,1967 at which time Mr. Lawrason Riggs III became the sixth President of the St. JosephLead Company. Mr. Riggs attended St. Paul's and Harvard, graduating in mining engineering from Harvard in 1936. He received his Mastersdegree from Columbia University.Mr. Riggs started his career with St. Joe as a summer employee in 1936 at Balmat, N.Y. He began regular employment at the BonneTerre mine October 3, 1939 as an Apprentice. He was called to active duty in the Navy in January, 1941 and served until September of 1948 as which time he was released from active duty after attaining the rank of Commander. Upon his return to the Lead Belt he assumed hisduties as Mechanical Engineer at the Bonne Terre Shops. He served as Mine Engineer, Mine Captain, Asst. Mine Superintendent, MineSuperintendent, Business Repr. and Division Superintendent prior to being transferred toNew Brunswick in 1954. He was transferred to the New York office in 1958 and Asst. Vice President and in 1960 became Vice President incharge of coordinating the Company's domestic mining and lead smelting activities. orders from the l06th InfantryDivision to establish a line east of St. Vith and hold off the Germans. He rounded up all available men of the 81st and 168th Engineer CombatBattalions and managed to hold off the Germans until 21 December whenthey broke up into small groups and attempted to make their way back toSt. Vith. Colonel Riggs was captured, but he escaped in Poland andfought with the Russians until he returned to his unit in April 1945.
painted this portrait of a fashionable American woman around 1815.
wears a high-waisted Empire-style gown. THE MARYLAND HISTORICAL SOCIETY, BALTIMORE, MARYLAND.